You’ll be able to see the Fallout 76 intro in-game very soon, but why wait? Beta access on PC starts on October 30, a week after Xbox One players get in. It’ll basically be the full game, plus some early kinks that Bethesda intends to iron out before the final release. Otherwise, it’ll let you play full game from start to infinity, but you don’t have to wait to see how you’ll humbly begin. This all comes as part of a speech to those entering Vault 76, which of course is the Vault you’ll emerge from in the new game. It’s up to you to single-handedly restore the traditional American way of life. Big pressure, but no worries – based on the games that follow in the timeline, you definitely don’t succeed. If you were worried that it’s a Ron Perlman soundalike, rest assured that Bethesda has confirmed it’s him on Twitter. There’s no replacing that voice, after all. 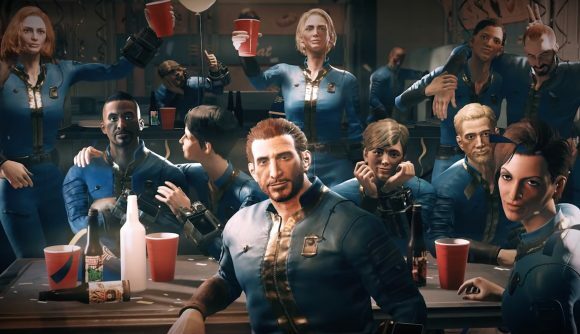 Bethesda revealed the date for the Fallout 76 beta earlier today, which gives a few weeks of early access before the proper Fallout 76 release date. You can follow that link for much more info on the game, from how the multiplayer works to the West Virginia-based setting.